Case presentations describing a congenital variation of palmoplantar keratosis are presented. The majority of these conditions are autosomal dominant with associated nail dystrophy. A variant condition is described with little palmar keratosis; however, finger nail and toe nail dystrophy is the most common identifying feature. Gene identification and treatment protocol are presented. Fortunately, these conditions are rare. A good knowledge of these conditions will help in proper diagnosis and treatment. Unna-Thost disease was first described in 1880 by Herrmann Arthur Thost and again described in 1883 by Paul Gerson Unna. [5,6,7] Synonyms for the disease include Brünauer-Fuhs-Siemens syndrome, Brauer’s syndrome and Brünauer’s syndrome. It is a disease of autosomal dominant origin characterized by severe palmoplantar keratosis. 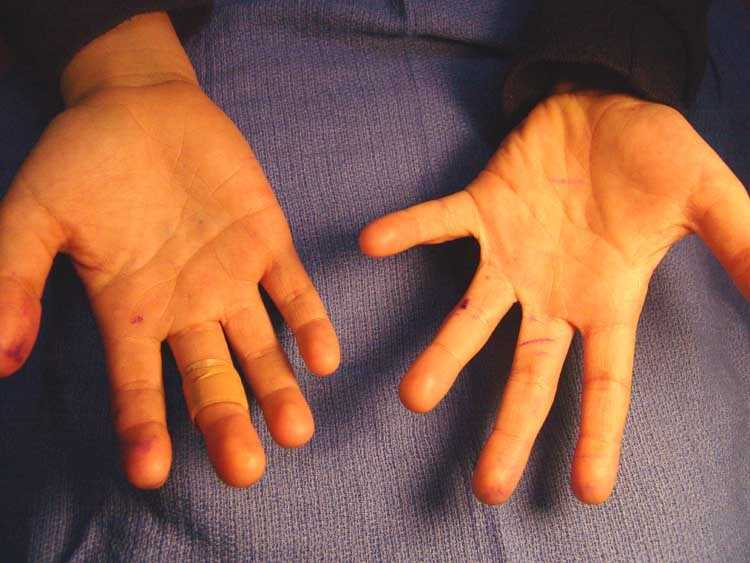 Deep fissures and hypohidrosis with thickened skin of the palms of the hands and soles of the feet usually occur within the first year after birth. Vohwinkel’s syndrome or keratoderma hereditaria mutilans is a rare autosomal dominant condition first described in 1929. Clinical manifestations first appear in infants and then proceed through childhood into adulthood. Keratosis described as honeycomb and starfish-like in appearance is common. In the later stages of the disease, pseudoainhum or auto amputation of the digits can occur due to constricting bands of keratosis around the digit. In fact, pseudoainhum is characteristic in a number of hereditary hyperkeratosis. [1,2,3,4] Papillon-Lefèvre syndrome (PLS), also known as Mal de Meleda , was first described by two French physicians in 1924. [3,8,9] It is an extremely rare genodermatosis inherited as an autosomal recessive trait, affecting children between the ages of 1-4. Psoriatic-like plaques involving the palms, soles and elbows are described that worsen in winter and are often hyperhidrotic resulting in a foul odor. Pachyonychia congenita (PC) is a rare genodermatosis that affects the nails of all the toes and fingers. 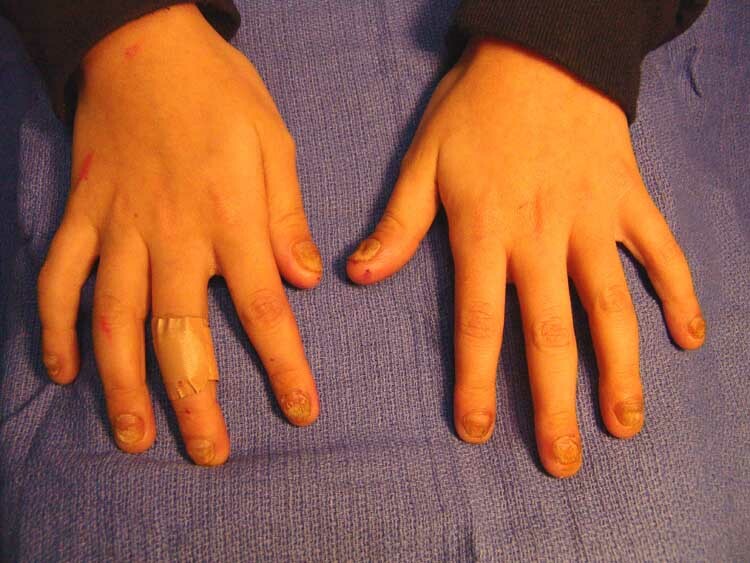 Other names and synonyms of this condition are called congenital dyskeratosis and pachyonychia ichthyosiformis. Vohwinkel’s syndrome can be associated with deafness, cancer, cardiomyopathy and adrenal insufficiency. PLS is often associated with severe periodontitis which usually starts at the age of three or four. This is seen with gingivitis and rapid destruction of the periodontium when deciduous teeth proceed normally. Other associated conditions of PLS include pyogenic liver abscesses with impaired immunodeficiency. The most common secondary associated symptom with PC is oral leukokeratosis with associated periodontitis and loss of teeth. The teeth develop normally and are lost within 1 year. Often, the clinical presentation is not as straight forward as the texts present. Clinical evaluation can present with diffuse as well as punctuate keratodermas and associated nail dystrophy. Clinical diagnosis is usually made by presentation and secondary associated conditions in complex keratodermas. Case 1: A 9 year-old female presents to our office with diffuse and punctate hyperkeratosis of both feet. (Fig. 1) Clinically, the hyperkeratosis is located on the soles of both feet with associated severe nail dystrophy to all fingers and toes. Figure 1 A 9 year old-female with severe plantar regions of hyperkeratosis (A and B). The toe nails are severely dystrophic (C). This condition began in infancy and is congenital. Interestingly, there is little palmar hyperkeratosis. (Fig. 2) The patient’s father, grandmother and aunt are affected with the same condition. All have PPK with associated fingernail and toenail dystrophy and discoloration. The patient presented with the condition at birth. The patient’s grandfather and uncle are asymptomatic. The condition is characterized by extreme pain. Figure 2 Although there is severe plantar congenital hyperkeratosis, the hands show very little palmar keratosis (A and B). The patient’s father has been treated with narcotics for a number of years. Most of the adults in the family abuse tobacco. The father, grandmother and aunt have undergone multiple surgical debridements in attempts to reduce keratosis. This included surgical debridement of deep keratomas, removal of nail plates and beds and metatarsal head compression osteotomies and 5th metatarsal head resections. To date, surgery was only temporarily effective. Retinoids were not used at the time. The family did not exhibit any complex symptoms and dentition was normal. No oral leukokeratosis was seen on examination. The entire family has diffuse hyperkeratosis and hyperkeratosis of all nails affecting both hands and feet symmetrically. The daughter is now treated routinely treated with Retinoid creams, keratolytic agents, debridement and accommodative padding on a regular basis. It appears that most family members affected had the condition worse on the soles of the feet than the hands. Although there is very little palmar keratosis in the 9 year-old female, both the nails of the hands and feet are affected. The patient’s hands reveal discolored, dystrophic changes to the finger nails, but very little palmer keratosis. Figure 3 A 39 year-old female with diffuse keratosis to both feet (A). 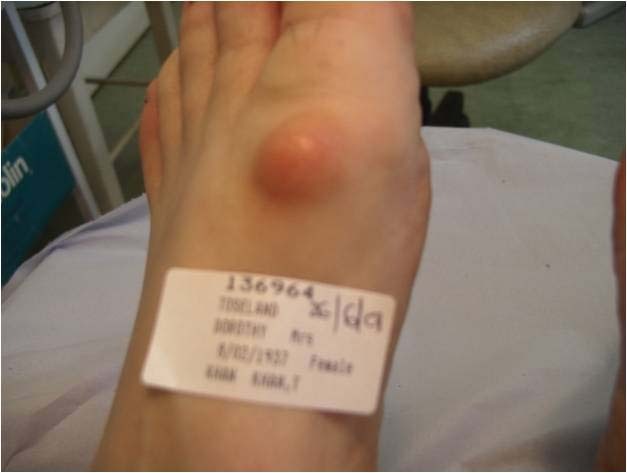 Secondary infectious tinea is also observed along the medial border of the foot (B). In this variant form, the hyperkeratosis is more diffuse rather than punctate along the soles of the feet. However, her hands appeared to be almost spared of the condition. There is some distal darkening just under the distal region of the finger nail. (Fig. 4). 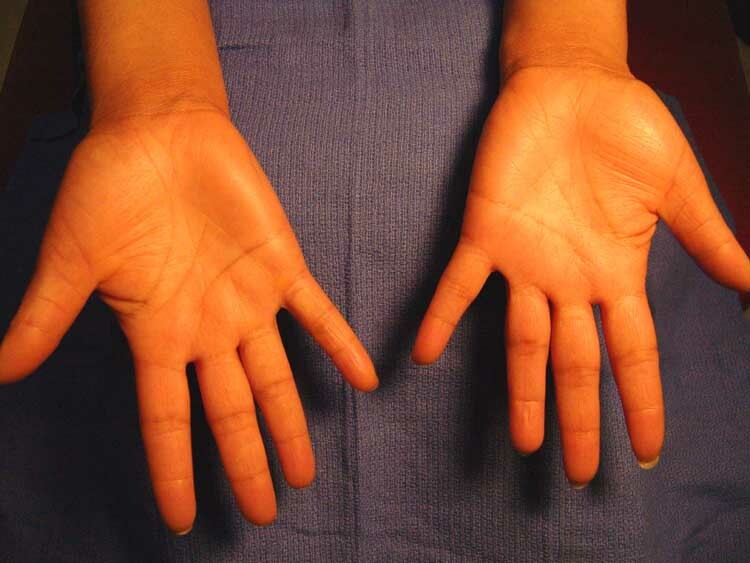 Figure 4 As in case 1, this 39 year-old female has very little palmar keratosis. Distal nail discoloration is observed (A and B). Her family history shows that most family members were affected by the disease. Her grandmother had the condition, but not the grandfather. They had eight children, 4 boys and 4 girls. All of the boys inherited the disease and only one girl. Three girls were unaffected. Her mother (who is unaffected) and father (who is one of the boys affected) had 2 boys and 4 girls. Of this group, her 2 oldest sisters have the condition and one brother is also affected. Only one male was unaffected. Some of the siblings have the condition much worse than the others. Topical and ancillary treatments can include saline soaks, topical Vaseline under occlusion, adding bleach to bath water, antibacterial soaps and a host of others too numerous to mention. Hereditary hyperkeratotic disorders appear to be heterogenous in nature. In the case studies presented, the autosomal dominant gene has no predilection for males or females and is randomized, passing the trait to some siblings while sparing others. Autosomal dominant carriers have a 50:50 chance of passing this gene on to their siblings and the individuals spared will not have the ability to pass on this disease and will not be carriers. It also appears that genetic polymorphisms and mutations continue to occur in varied cases. This would explain why some individuals have the condition worse and some have milder forms of the disease. It can be safe to say that the majority of PPK disorders can have variant forms and severity. As varied as this disease can present, treatment results can also vary. We have found that aggressive debridement with use of topical keratolytics with oral retinoids provide some of the best results. Surgical procedures should only address regions that are most problematic and don’t respond readily to conservative treatment regimes. Educational instruction and understanding should include a thorough discussion with your patients that results can vary and may be unsuccessful or only temporary. Discussing the disease and treatment options will enable better care of the patient with this frustrating condition. 1. Kline A. Keratotic lesions of the footH. Podiatry Internet Journal 1 (1): 8, 2006. 2. Bari AU. Keratoderma hereditarium mutilans (Vohwinkel syndrome) in three siblings. Dermatology Online Journal. 12 (7): 10, 2006. 3. Janjua SA, Khachemoune A. Papillon-Lefèvre syndreom: Case report and review of the literature. Dermatology Online Journal. 10 (1): 13, 2004. 4. Caproni M, Fabbri P. Pachyonychia congenita Orphanet Encylopedia., (online PDF) accessed 21/12/2008. 5. Thost A. Über erbliche Ichtyosis palmaris et plantaris cornea. Dissertation. Heidelberg, 1880. 6. Unna PG. Über das Keratoma palmare et plantare hereditarium. Vierteljahrsschrift für Dermatologie und Syphilis. Wien. 15: 231, 1883. 7. Unna Thost Syndrome. Who named it? (online), accessed 21/12/2008. 8. Papillon MM, Lefèvre P. Deux cas de kératodermie palmaire et plantaire symétrique familiale (maladie de Meleda) chez le frère et la soeur. Coexistence dans les deux cas d’altérations dentaires graves. Bulletin de la Société française de dermatologie et de vénéorologie. 4 (31): 82-87, 1924. 9. Papillon MM. Lefèvre syndrome. Who named it? (online), accessd 22/12/2008. 10. Vanamide Cream (online PDF) , accessed 21st December 2008. 11. Chan A, Hanna M, Abbott M, Keane R. Oral retinoids and pregnancy. The Medical Journal of Australia. 165: 164-167, 1996. 12. The Universe of Genetic Testing, online resource. [online] , accessed date 21/12/2008. 3130 South Alameda, Corpus Christi, Texas 78404. 1 Adjunct Clinical Faculty, Barry University School of Podiatric Medicine. Private practice, Chief of Podiatry, Doctors Regional Medical Center. Corpus Christi, Texas, 78411. Marigold therapy has been used for over 30 years in the United Kingdom and has been evaluated by numerous randomized double-blind placebo-controlled studies for various skin issues on the lower extremity. Various species of marigold are naturally anti-viral, keratolytic, and anti-inflammatory when applied topically to the affected area. Marigold therapy offers a non-invasive and gentle treatment for difficult to treat plantar verruca, painful hyperkeratotic lesions, and inflamed bursa secondary to hallux abducto valgus. Two marigold species, Tagetes and Calendula, have been used for centuries as herbal remedies for various ailments. (Figs.1ab) Phytotherapy, or the use of plants for their medicinal properties, is the basis for most pharmaceutical products. In particular, the marigold has an interesting history as both a topical and an oral remedy. Figures 1ab The Tagetes (a) and Calendula (b) marigold species. This article will review the literature for the use of Tagetes and Calendula species on the most common podiatric conditions treated and will show their usefulness as an effective and non-invasive therapy. The chemicals found in the multiple Tagetes species described will demonstrate keratolytic, anti-viral, and anti-inflammatory properties. The use of the Calendula species of marigold will be described, including a case study demonstrating its use in non-healing ulcerations. 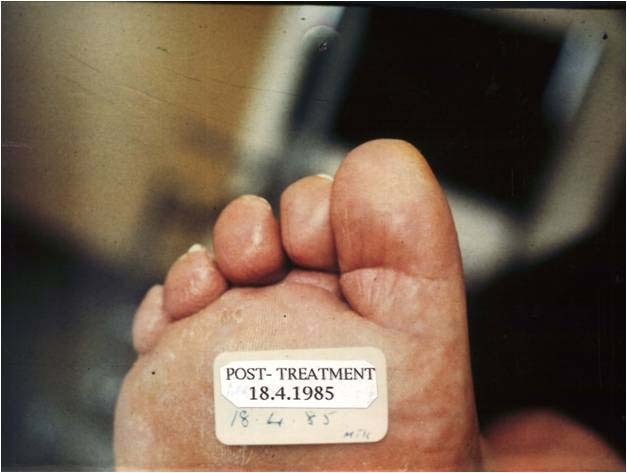 Painful hyperkeratotic lesions, arising from both mechanical stressors and boney deformity, are extremely common podiatric conditions. Treatments range from conservative debridement, change of shoe gear, orthotics, and topical keratolytics to surgical correction of the underlying deformity. Figure 2 Painful plantar hyperkeratotic lesions prior to marigold therapy. Figure 3 Clearance of lesions after four treatments; one month after initial therapy. In 1996, Tagetes erecta was used for a double blind placebo controlled study for thirty patients with painful plantar hyperkeratotic lesions. They were separated into three groups: marigold therapy with an aperture pad, marigold therapy without an aperture pad, and placebo marigold therapy with aperture pad. The placebo paste was formulated to look and feel identical to the active paste but with no active chemical ingredients. 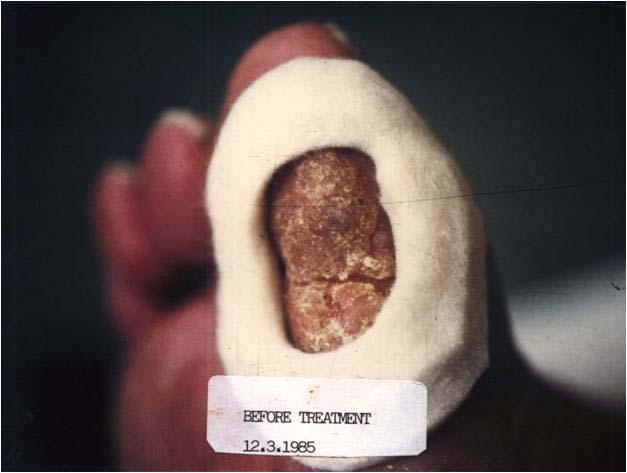 In the semi-compressed felt aperture pad, a paste of fresh plant combined with isopropyl alcohol was applied by the podiatric practitioner once a week for four weeks over the painful lesions. The patients wore the poultice dressing for a week and returned weekly for lesion debridement by the practitioner. At the end of the treatment period, patients received either active or placebo tincture and ointment to use on the test area at home for four weeks. The active paste group with a pad showed a significant decrease in hyperkeratotic lesion width, length, and pain when compared to the placebo group. The active paste group with pad versus the active paste group without pad also had a significant difference in width, length and pain showing that the aperture pad had helped to offload the lesions as well as compartmentalize the marigold paste to the affected area. Reducing the trauma at the painful hyperkeratosis site is believed to decrease cytokine production thus decreasing kertinocyte production. This coupled with the natural keratolytic property of Tagetes (containing tagetone among other chemicals) proved to be a promising therapy, which could be used prior to custom molded orthotic therapy or as an alternative to surgical correction. The keratolytic property of Tagetes was further explored in several published case studies. [5,13,25] Patients receiving a similar therapy as previously described reported pain relief after 48 hours of the first dressing application. Interestingly, the patients who used the home therapy and orthotic control after the initial eight week period had no recurrence of the lesions after one year. Figure 4 Recalcitrant plantar verruca prior to marigold therapy. Figure 5 Clearance of the lesion after four treatments. Forty patients were randomly placed into one of four groups; active, placebo, active with pad, and pad only with no paste. Patients were treated twice a week for two weeks and then used home therapy consisting of the tincture and ointment for four weeks. The lesion surface area pre-treatment and post-treatment was analyzed with a wound mapping system. Results showed that the active group had a significant difference in appearance, pain, and size compared with the placebo group. A combination of the Tagetes and Thuja into a paste has been used extensively since the separate controlled studies were completed. A small case study showed the usefulness of the paste in immunocompromised patients with mosaic type verrucae. All of the patients were HIV positive with detectable viral loads and verrucae that did not respond to conventional treatment. Four applications of the combination paste eradicated the verrucae in two of the three patients. (Figs. 6,7) Although further research is warranted in this population, it is a hopeful outcome for a non-invasive treatment. Figure 6 Immunocompromised patient with mosaic plantar verruca prior to therapy. Figure 7 Clearance of mosaic verruca after four treatments. 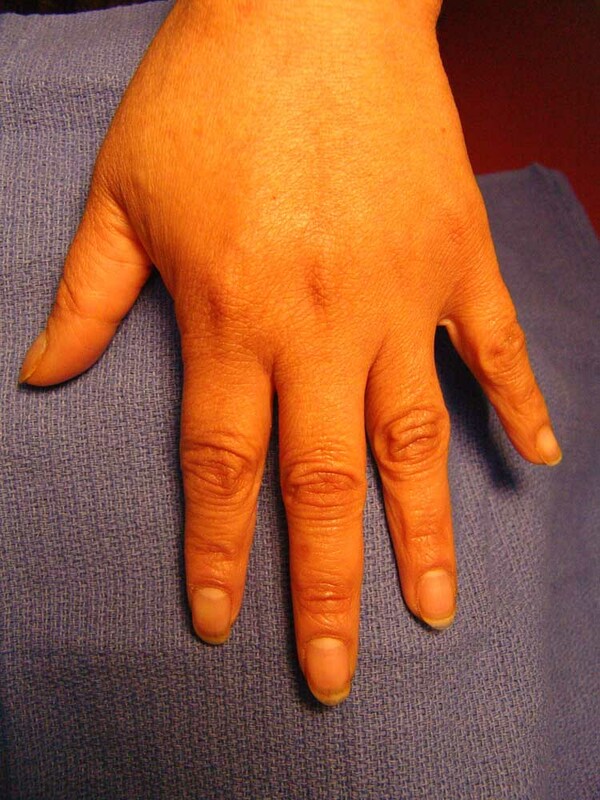 Figure 8 Patient with significant bursitis pain over bunion prior to marigold therapy. Figure 9 Decrease of erythema and inflammation at bunion site after therapy. A randomized double-blind placebo controlled study utilized sixty patients with either bilateral or unilateral inflammation was performed. Twenty patients with bilateral inflammation were randomly placed into one of two groups: active paste with aperture pad and placebo paste with protective pad. Forty patients with unilateral bursitis were randomly placed into similar groups with an identical treatment plan. All patients followed the paste and pad therapy with either an active or placebo home therapy consisting of tincture and ointment spray to use on the area daily. Soft tissue swelling at the medial eminence of the bunion was assessed using calipers pre and post treatment. Patients in both of then active groups had complete relief of pain after eight weeks and a 35% reduction in soft tissue swelling at the bursitis site. In the placebo group showed minor reduction in pain which was most likely due to the presence of the aperture pad. However, their original symptoms returned at a week 4 when the patients started the placebo home therapy. Marigold’s ability to reduce bursitis inflammation was further studied in a group of 45 patients with unilateral pain. Patients were randomly placed into five groups: six groups with active marigold paste (each group had various extracts in organic solvents) and aperture pad and three groups with placebo without aperture pad. After a similar treatment plan described in the previous study, Group A (active paste in ethanolic extract with pad) had 100% in level of pain (using the visual analogue pain scale) while Group G had 30% reduction in their level of pain. Both of these studies support the combined use of marigold therapy with a protective aperture pad for patients with painful medial eminence bursitis who are not surgical candidates or do not wish to undergo surgical correction. Khan states, in his 1982 publication in World Medicine on the uses of various species of marigolds, that Calendula species promote healthy granulation tissue. There are currently clinical projects underway at the School of Pharmacy at the University of London on these properties of Calendula. There was a single reported case of use in a diabetic ulcer, by Khan in the United Kingdom, using the formulation that was utilized in the following case study. They reported a statistically significant difference in reduction of total wound area compared with the control (p<0.05), showing an overall decrease of 41.71% in the experimental group compared with 14.52% in the control group. They conclude that application of Calendula extract significantly increases epithelization in chronic venous ulcerations. This study by Duran, et al., lends scientific credence to the use of Calendula extract as a treatment to decrease the healing time of chronic ulcerations. However, randomized control studies have to yet to be completed. 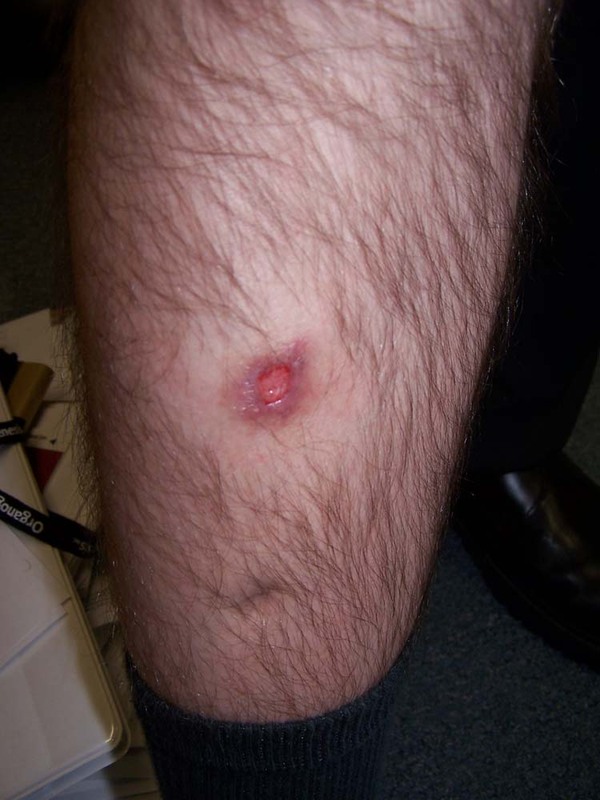 A thirty year old Caucasian male presented with concern of an ulcer on the anterior right leg. 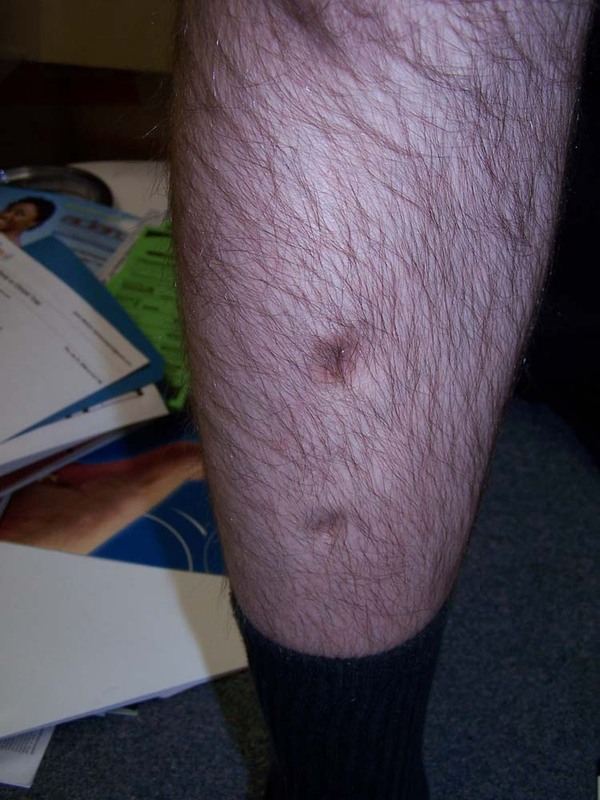 The superficial wound was over the site of an external fixator pin tract scar, which had occurred fifteen years earlier. The injury was a result of a blunt blow on a coffee table, shearing off the hypertrophic scar. The patient reported bleeding globally across the lesion at the time of injury. He denied a personal or family history of family diabetes, hypertension, coagulopathy and peripheral vascular disease. Treatment initiated by the patient consisted of triple antibiotic ointment and a bandage. The patient reported that approximately one week after the injury, in the course of cleansing the wound, eschar that had previously formed self-debrided, and the wound appeared as it did on the day it was sustained. The same treatment was resumed, with a similar course of routine healing. Two weeks following the injury, a similar loss of eschar was duplicated. The second event led the patient to seek treatment. On initial examination, the patient had a 2.5 cm x 2 cm x 0.5 cm circular lesion over the crest of the anterior tibia in the central one third of the leg. The lesion had a mixed granular and fibrotic base, with mild surrounding erythema and no edema (Figure 10). Figure 10 Anterior leg ulcer on intital presentation prior to marigold therapy. No undermining was present, and there was no maceration of the wound edges. There was no purulence or malodor. The scars from the other pin tract sites were also examined and were labeled hypertrophic. The patient received a regimen of marigold therapy for the wound. The medication used was the HTS 087 Tincture and Ointment. (Marigold Footcare Ltd, UK) The therapy regimen consisted of a combination of the tincture and ointment placed in an aperture pad which was then covered with medical tape and gauze over the lesion for three consecutive days. The same regimen was followed every other day after the initial three day period for two weeks. Figure 11 The lesion with decreased erythema and increased granulation tissue 48 hours after therapy. Figure 12 The resolved lesion. The complex nature of this wound, having formed over a pre-existing scar and in a traditionally difficult-to-heal area anatomically, caused a delay in wound healing despite the patient’s uncomplicated medical history. The wound’s recalcitrance in healing warranted additional therapy than just antibiotic ointment and patience. It should be noted that over the counter and/or health food store creams and preparations of marigold do not have the same effect as the previously discussed studies show. The extracts used for the controlled and case studies were researched and developed by M Taufiq Khan and M Tariq Khan over thirty years. They developed specific extracts that are directly applied by the podiatric physician to the patient: an anti-viral paste (for verruca), an anti-inflammatory paste (for bursitis and tendonitis), a keratolytic paste (for hyperkeratosis), and an anti-fungal paste (for nails). The patients then continue with home therapy that consists of tinctures and ointments with the same properties. These products were only recently introduced to the United States. The second author was the first United States podiatric physician to become certified in the use of the marigold products from Marigold Footcare, Ltd., and the Royal London Homeopathic Hospital, London, UK and will be able to certify (in conjunction with the Hospital) other podiatric physicians in the future. In order to ensure appropriate use of the extracts, certification will only be available to podiatric physicians and is required for both the usage and purchasing of the products. Further research will continue into using the extracts on genodermatoses, onychomycosis, and other podiatric conditions. 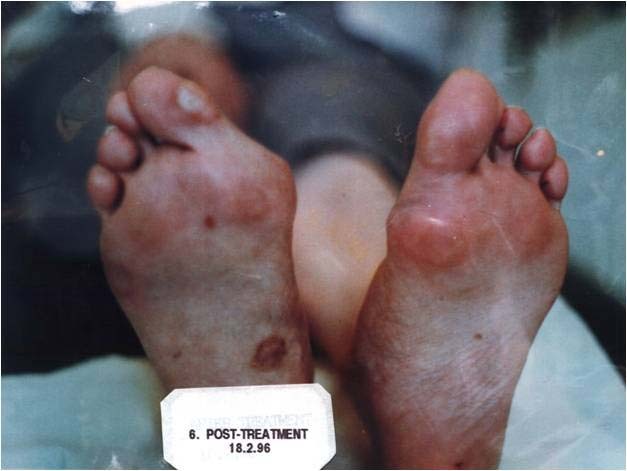 The superficial ulceration case study and immunocompromised patients with verruca case study combined with studies performed outside of the United States show the promise of the continued investigation of marigold therapy as a treatment for various podiatric conditions. Marigold therapy has consistently been shown to provide gentle, non-invasive treatment that allows patients a painless alternative treatment. 1. Davidson L., “Marigold rediscovered: a cure for callosities,” Therapy. Pg 1, 1980. 2. Khan M., et al., “Homeopathic treatment of common foot conditions,” British Journal of Dermatology Nursing. 1: 20-23, 2003. 3. 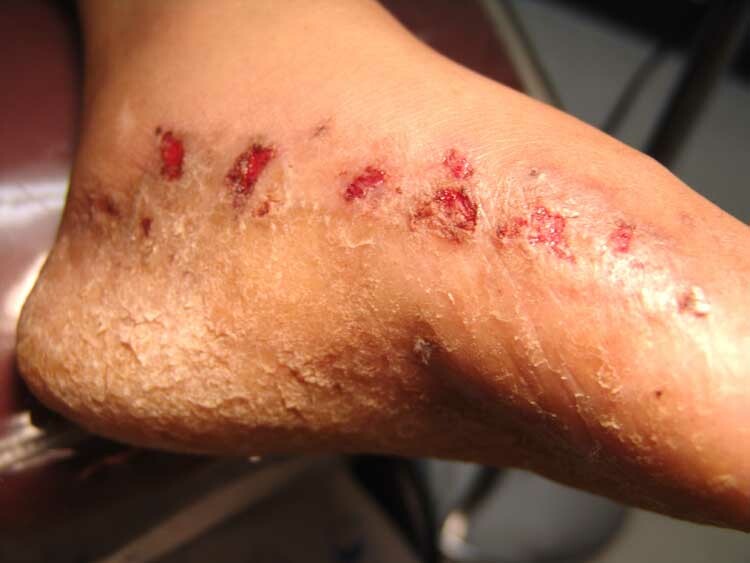 Khan M., et al., “Marigold Treatment of foot conditions,” Dermatology in Practice. 10 (3): 28-30, 2002. 4. Khan M., et al.,“Podiatric Treatment of hyperkeratotic plantar lesions with marigold Tagetes erecta,” Phytotherapy Research. 10: 211-14, 1996. 5. Khan, et al., “Treatment of plantar hyperkeratosis with homeopathic podiatry,” Podiatry Now. Dec. 502-505, 2000. 6. Talhouk R., et al., “Anti-inflammatory bioactivities in plant extracts,” J Med Food. 10 (1): 1-10, Mar 2007. 7. Herold A., et al., “Antioxidant Properties of some hydroalcoholic plant extracts with anti-inflammatory activity,” Roum Arch Microbiol Immunol. 62(3-4): 217-227, 2003. 8. Fuchs S., et al., “Protective effects of different marigold (Calendula officinalis L.) and rosemary cream preparations against sodium-lauryl-sulfate-induced irritant contact dermatitis, “ Skin Pharmacol Physiol. May 20, 2005. 9. Hernandez F. “Historia de las plantas de nueve Espana.” Mexico Irmenta Universitaria. 1: 90-91, 1942. 10. Caius J. “The Medical and Poisonous Compsoitae of India, “ J Bombay Natural History Society. 41: 90-91, 1940. 11. Pommier P., et al., “Phase III randomized trial of Calendula officinalis compared with trolamine for the prevention of acute dermatitis during irradiation for breast cancer, “ J Clin Onco.l 22 (8) ; 1447-1453, Apr 15, 2004. 12. Pirker C., et al., “Cross-reactivity with Tagetes in Arnica contact eczema,” Contact Dermatitis. 26 (4): 217-219, Apr 1992. 13. Khan M. “Why marigolds can be a corny treatment: A pilot study of the effects of marigold in the treatment of painful corns,” World Medicine. 42-43, Feb 1982. 14. Jimenez-Medina E., et al., “A new extract of the plant Calendula officinalis produces a dual in vitro effect: cytotoxic anti-tumor and activity and lymphocyte activation,” BMC Cancer. 6: 119, 2006. 15. Wang M., et al., “Antioxidant activity, mutagenicity/anti-mutagenicity, and clastogenicity of lutein from marigold flowers,” Food Chem Toxicol Epub Sp; 44(9) : 1522-1529, Apr 25, 2006. 16. Barajas-Farias L., et al., “A dual and opposite effect of Calendula officinalis flower extract: chemoprotector and promoter in a rat hepatocarcinogenesis model” Planta Med. 72(3) 217-221, Feb 2006. 17. Rusu M., et al., “The hepatoprotective action of ten herbal extracts in CCl4 intoxicated liver,” Phytother Res. 19(9): 744-749, Sep 2005. 18. Radioza S., et al., “Antimicrobial activity of Calendula L. plants,” Ukranian Journal of Microbiology. 21-25, 2007. 19. Khan M., et al., “Treatment of Diabetic foot ulcer with Homeopathic Podiatry,” Poster Presentation, Symposium on Advances in Skin and Wound Care, Las Vegas, 2005. 20. Duran V., et al., “Results of the clinical examination of an ointment with marigold (Calendula officinalis) extract in the treatment of venous leg ulcers,” Int J Tissue React. 27(3) ; 101-6, 2005. 21. Leung A Encyclopedia of Common Natural Ingredients, Used in Food, Drugs and Cosmetics. Academic Press, New York, 1980. 22. Khan M. “Phytochemical and biologic studies of Tagetes erecta and its clinical evaluation in the treatment of hallux abducto valgus and its associated condition bunion,” PhD Thesis, Faculty Medicine, Centre for Pharmacognosy, School of Pharmacy, University of London, 1999. 23. Sharma A. “Tagetes genus,” Wealth of India. Vol X, SP W p 109, 1961. 24. Khan M., et al., “Comparative clinical studies of Calendula offcinalis and Tagetes varieties of marigold,” 35th LMHH Congress, Sussex, 488-492, 1982. 25. Khan M., et al., “Clinical evaluation of Tagetes erecta in the treatment of parakeratosis,” Phytotherapy Res. 10: 186-188, 1996. 26. Khan M. Jnr. “Tagetes signata in the treatment of verruca pedis,” J British Pod Med. 51: 118b, 1996. 27. Khan M., et al., “A double blind placebo study of topical Thuja occidentalis on verruca pedis in children and adults,” JEADV. 1: S251, 1999. 28. Vlahovic T., et al., “The Use of Marigold Therapy on Mosaic Verrucae in the HIV population,” Presented at AAD, San Antonio, TX 2008. JAAD. 58(2): AB34, 2008. 29. Kasahara Y., et al., “Effect of methanol extract from flower petals of Tagetes patula L. on acute and chronic inflammation model,” Phytother Res. 16(3): 217-222, 2002. 30. Khan M. “The podiatric treatment of hallux abducto valgus and its associated condition bunion with Tagetes patula,” J Pharm Pharmacol. 48: 768-770, 1996. 1Fourth year student, Temple University School of Podiatric Medicine, Philadelphia, Pa. 19107. 2Associate Professor, Temple University School of Podiatric Medicine, Philadelphia, Pa. 19107. 3Deputy Director of Moeopathic Podiatry, The Marigold Clinic, Royal London Homeopathic Hospital, London, UK.